In one of the most colossal understatements ever, Cloudera co-founder Mike Olson declared, "It's pretty hard to build a successful, stand-­alone open source company." Having spent 15 years trying to do exactly that, I would go one step further: It's impossible. Yes, we have Red Hat. But that's all we have. Investor (and former open source executive) Peter Levine insists that "we will never have another Red Hat," and he's right. But this may be because the Amazons of the world are increasingly eating the Red Hats of the world -- one SaaS business at a time. On the surface, it seems bizarre that we don't have more billion­-dollar open source companies. After all, open source seemingly powers everything, from our most significant data infrastructure to mobile to cloud. 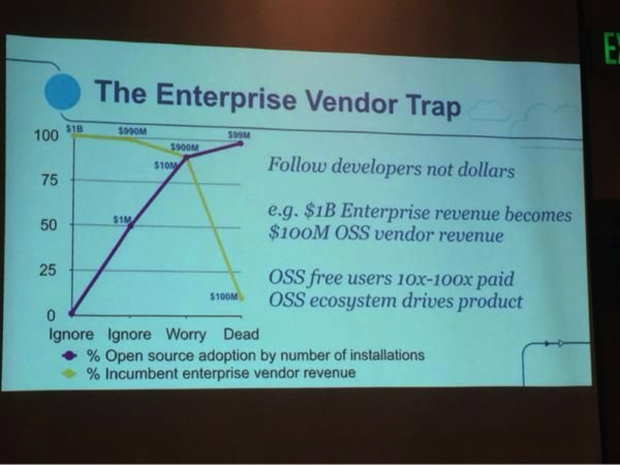 It's open source all the way down. As Olson details, "No dominant platform-level software infrastructure has emerged in the last 10 years in closed source, proprietary form." Proprietary is simply not how things are done anymore. As Levine argues, "The [Red Hat-esque] open source support model generates a fraction of the revenue of other licensing models," leaving little left over to invest aggressively in innovation and growth. A better model, he writes, is the "open source as a service" (OSaaS?) model: "By packaging open source into a service (as in cloud computing or software as a service) ... companies can monetize open source with a far more robust and flexible model, encouraging innovation and ongoing investment in software development." He's absolutely right. What isn't clear, however, is who wins in this OSaaS world. After all, once we turn open source into a service, there's no particular reason to expect that the originator of the code will reap the most profit from the software. Take MySQL, for example. The database has changed hands a few times, with Sun acquiring MySQL AB in 2008, then Oracle picking up the asset through its acquisition of Sun the following year. But MySQL, Sun, and Oracle have collectively made a heck of a lot less -- orders of magnitude less -- by selling MySQL-related services than Amazon Web Services has made by selling MySQL ­as­ a­ service (that is, Relational Database Service). Nor will MySQL be the last open source project to be more heavily monetized by a cloud giant than by the original developers who brought it into the world. Take IBM, for example. As RedMonk analyst Stephen O'Grady rightly points out, IBM has been taking a beating from a market that expects cloud, even as the company continues to primarily peddle on-premise, proprietary software. Thus, the company is aggressively moving toward as-a-service offerings: "The acceleration of IBM's move toward services business, from databases to application development, is understandable in the wider context of its financials." Put another way, IBM goes cloud or IBM goes out of business. This isn't only an IBM thing. Oracle, HP, and every legacy IT giant must accelerate this shift to cloud or face extinction at worst, irrelevance at best, which means that these companies that have happily partnered with MongoDB, Hortonworks, and other open source upstarts will increasingly compete with them. While I was at MongoDB, the company announced a far-reaching partnership with IBM to collaborate on MongoDB APIs for application developers. Two years later, IBM acquired Compose, a MongoDB-as-a-service company, essentially declaring war on MongoDB's revenue stream. IBM's ability to win that war will depend on whether it can operate the MongoDB database in the cloud better than MongoDB itself, which has been steadily improving its own ability to deliver MongoDB as a service. This is the battle that every open source project turned company will face as the infrastructure giants struggle to reinvent themselves around open source and the cloud. It will make for better software service offerings for customers, but also create an exceptionally difficult market for stand-alone open source startups. As if the open source software business hadn't been hard enough already.